Can someone with a tattoo be buried in a Jewish cemetery? Can a person with a tattoo be buried in a Jewish cemetery? There is nothing in Jewish law which prohibits a person who has a tattoo from being buried at Mount Sinai or any Jewish cemetery. We hear this question often due to today’s popularity of tattoos as well as how this subject is often the mentioned in pop culture. 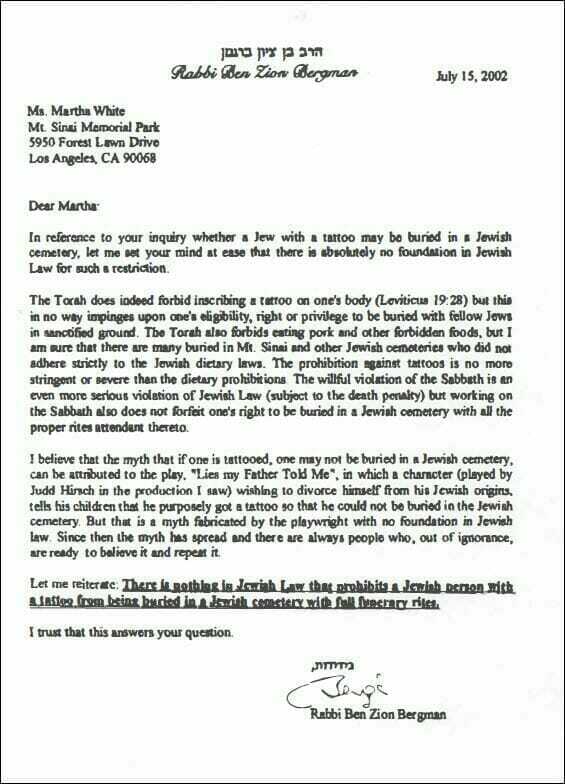 In fact, we refer to it as the “Jewish Cemetery Tattoo Myth” and in 2002, Rabbi Ben Zion Bergman eloquently answered this question for us. Please click on the letter below to read it in its entirety. If you have additional questions about this subject,l please contact Mount Sinai for clarification.